Look at these beauties! Turnips, beets, garlic, sweet potatoes, red onion, yucca root, and jicama. 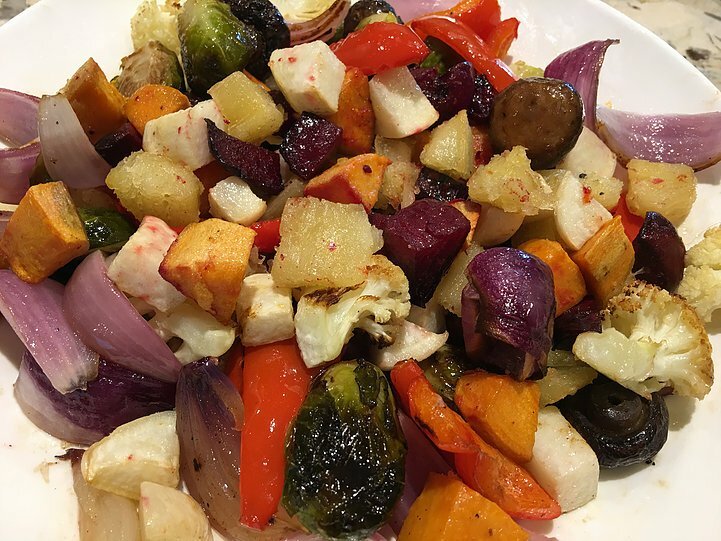 These are just some of the amazing root vegetables loaded with dietary fiber that is so healthy for your gut. 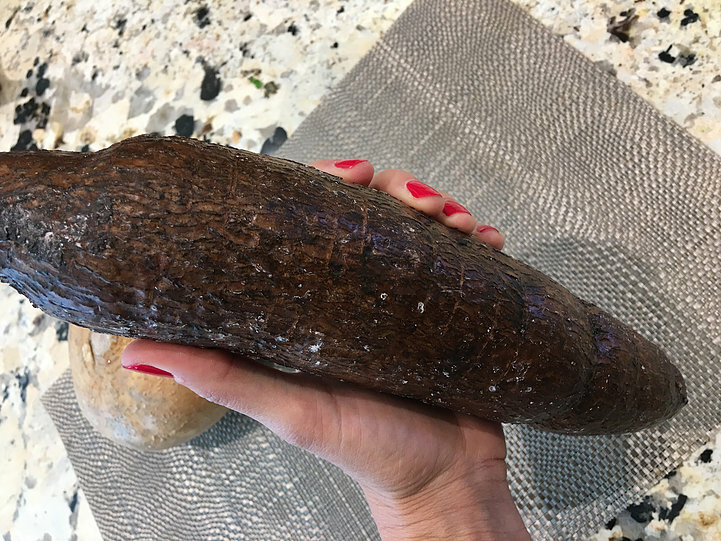 Yucca is the long, brown root vegetable pictured below. Something new to keep it interesting! Here we are roasting vegetables together. It was his idea to introduce a new vegetable each week. Really?!! He is trying all of them. What?!! Spend some time in the kitchen with your kids and they will surprise you too. What’s so special about root vegetables? Although these vegetables are rich in vitamins and minerals, it seems that the high dose of dietary fiber gives the biggest health benefits. Most of us know that fiber helps move food through our digestive system, but did you know that it keeps harmful cholesterol levels down. Fiber also slows down the absorption of food, stabilizing blood sugar, which helps prevent type 2 diabetes. So many health benefits from these tasty vegetables! Here’s a big one. The fiber also serves as a prebiotic, a source of food for the good bacteria that live in your gut, helping the healthy bacteria to populate and colonize for the best gut health. All those probiotics you take don’t do much good if they don’t have a source of food to live on. So eat lots of root vegetables! 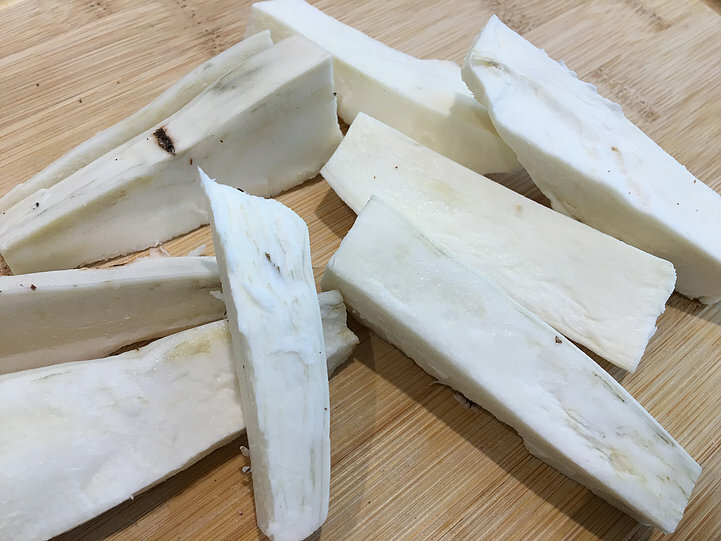 On a quest to introduce new foods, we are cooking the yucca root this week. Trying new foods keeps things interesting in the kitchen. Kids are naturally curious. This one will get their attention! I was fascinated by this root vegetable. A native plant of South America, its blooms are big white flowers. The root with its brown, scaly, bark-like skin is so unique. You want to touch it and see what it feels like. It makes you wonder what the inside looks like. It begs the question, what are we going to do with this? Sword fighting came to mind as one option. Most of all, we couldn’t wait to taste it! 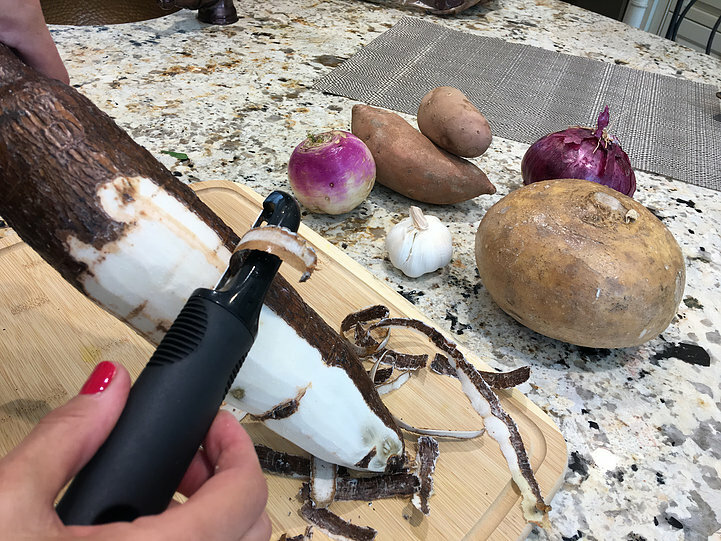 We started peeling the yucca root with a vegetable peeler and switched to a sharp knife. It is much easier to remove the skin with a knife. The inside was a surprise. I did not expect it to be bright white! It is poisonous to eat this root raw, so know that you have to cook yucca first. Other root vegetables like jicama and turnips are delicious raw. 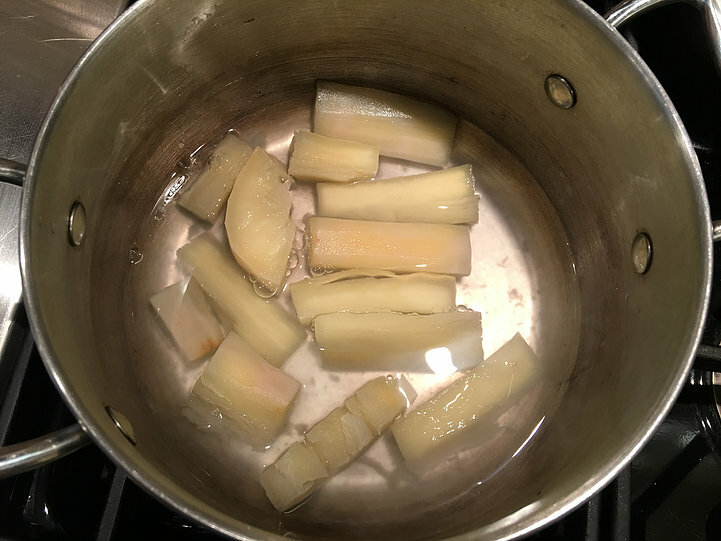 We boiled the yucca root for 15 minutes before roasting. 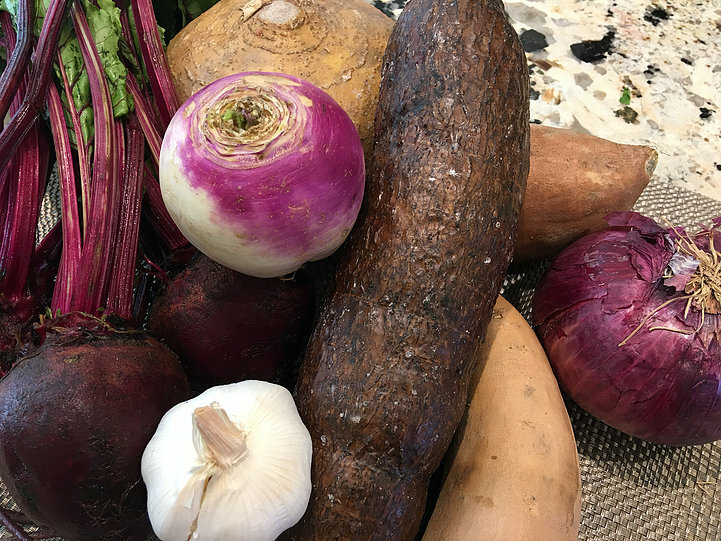 We added all kinds of other vegetables to our pan – yucca root, beets, sweet potatoes, and turnips. 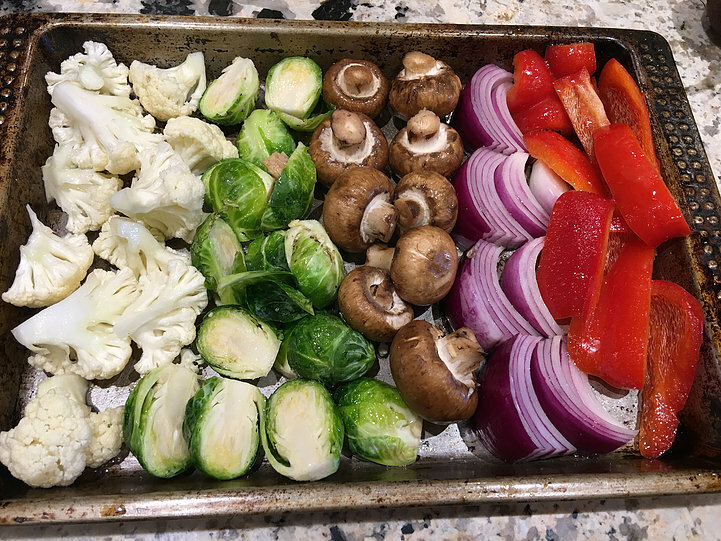 Cauliflower, Brussels sprouts, mushrooms, red onion, and red pepper. Roasting vegetables brings out the sweetness. The variety gives your kids choices and adds a lot of color making the dish more inviting. 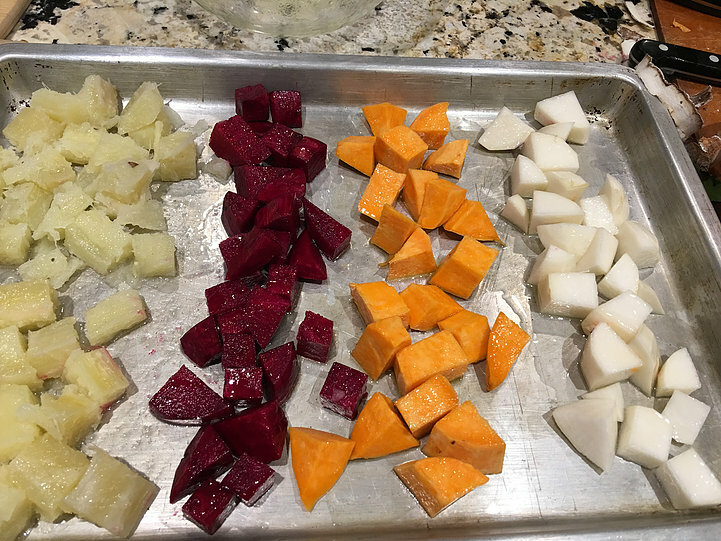 Peel root vegetables - yucca, beets, sweet potatoes, turnips, red onion. I often leave the skin on the sweet potatoes and turnips. It's up to you. Cut all vegetables into bite size pieces. Place in a bowl and toss with olive oil and salt. Place on a rimmed baking pan in a single layer. Roast in the oven on the top shelf -- 45 min - 1 hr for yucca, beets, sweet potatoes, and turnips. 30-40 min for cauliflower, Brussels sprouts, mushrooms, onion, bell pepper. Watch them for doneness because depending on the size of your chunks and the heat of your oven they may cook faster. This was delicious with a fried egg on top! Enjoy!